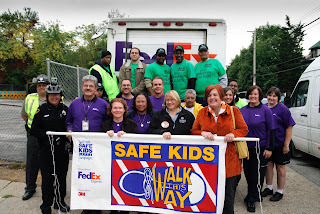 "Safe Kids USA and FedEx Team Up to Focus on Children's Views of Road Safety around the World"
I had the privilege to participate in this event at two different Pittsburgh, PA schools. The first school on our stop was Johnston Elementary School in Wilkensburg, PA. I took the first image across the street from the main entrance to the school. Unfortunately, there are no speed bumps to slow cars down in front of the school. 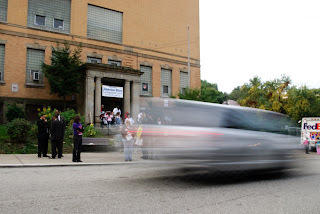 Although the posted speed limit is 15 MPH, most cars 'flew' past the school with kids in full view at very fast speeds. What I found amazing is that so many vehicles passed through this area but many had no regard for the safety of the kids. The second image I took in a play area near the school. 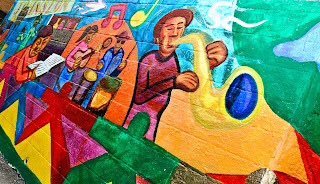 The colors and lines caught my attention and I had to capture its beauty. The final image is a shout out to all the workers who participated in Safe Kids day around the world! When you see a kid [anywhere] please slow down!